When Samsung first introduced the Galaxy Note back in 2011,the over-sized phone/tablet was immediately dubbed the “Phablet.” It was a Galaxy phone on steroids; too big for your pocket, too small to be a useful tablet. Two years, one new model and a huge number of sales later, Samsung has introduced the Note 3 and this version is thinner, lighter and way more powerful. Basically, anything you can do on a tablet, like jotting down quick notes, looking up a number or saving a web page for later viewing, you can do on your Note. The addition of the S Pen enhancements makes those tasks even easier. The Note 3 has a big, bright 5.7 inch Super AMOLED HD display, larger than the original version’s 5.3 inches and the Note 2's 5.5 inches, but it’s lighter and slimmer, giving it a comfortable feel in your hand. The back of the phone has a soft, textured fabric, making it easy to hold. The battery life has been boosted (3,200mAh) and the 13 megapixel rear camera shoots full HD video. It will come in 32 and 64GB versions and has 3GB of internal RAM. Aside from the faster capabilities of the device itself, what really sets it apart is the S Pen. Samsung says they realized people weren’t using all the built-in functionality of the stylus-like pen so they brought the prompts to the forefront. Now, removing the pen brings up something called “air command.“ If you want to jot down a few notes, you can use the S Pen to write down someone’s contact info, email address or the name of a website. When you go back to that particular note it’s now actionable, which means you can click on the website you just wrote down and be taken to the site in the browser, or click on the person’s email address to update their contact information. Samsung referred to this as a Post-it note on steroids but it basically means everything is actionable so you no longer have to cut-and-paste. Just click to add something to your calendar contacts, see it on a map or place a phone call. Another interesting feature is the Scrapbook which to me looks like a personal Pinterest. Say you’re planning a party or organizing a conference. Any website image or product you see online, you literally draw up box around the product and it saves it and opens it in your scrapbook - complete with meta data. That way, when you want to return to it, or share with someone else, it’s all in one place as a visual representation. I also really liked Screen Write, which is very similar to popular apps on the market that let you write on images. Take a picture and you can immediately use the S Pen to write on that image. You can then save or share the image. Great for sharing fun party pictures or swapping notes when house hunting. For those of you who like to multitask, and who among us doesn’t, there’s Pen Window. This is designed for people who like to have an internet browser open on one side of their screen with perhaps email or messaging open in the other. I was able to take an image out of the top half of my screen, and drag it to the IM section on the bottom, without having to cut-and-paste. 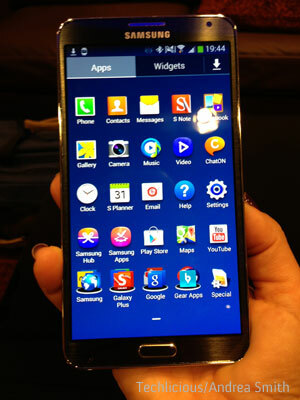 I got plenty of hands-on time with the Note 3 and was very impressed with what Samsung has put forth. Yes, the screen is large, but compared to other phones being shown here, it’s not that huge. You’re able to see everything you need without having to find your reading glasses and with the added enhancement of the Galaxy Gear smart watch, this is a combination not to be denied. There is no price or launch date has been announced yet for the Note 3, but Samsung confirms it will be available in the US on AT&T, Verizon, Sprint, T-Mobile and US Cellular. 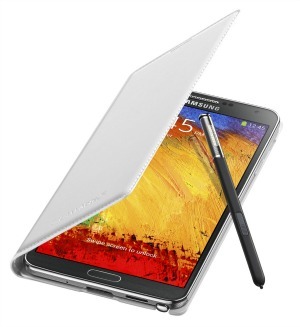 Everyone always asks if I like my Note 3 and if it’s too big. I always laugh when I get asked this. Yes it’s big. But after a couple days, the size feels normal, especially compared to my iPhone 5.